Thanks to Orange County’s only in-house art restoration department, Bartwood’s art experts are able to clean and restore all types of artwork and photos that have been damaged due to fire, smoke and water. Our team of Josh and Justin Landis are trained industry leaders in the best restoration techniques and practices and together provide more than 40 years of art restoration expertise. From a detailed cleaning to a ripped canvas repair we can bring that beloved piece to back to show quality. With more than2,000 custom framing options, we can find the perfect option for your piece. Knowing that some frames can be as irreplaceable as the art inside it, we can expertly match the color and repair the frame to gallery condition. From one piece to a thousand, we are able to accommodate an order of any size with custom framing, display options and installation. Custom made and sized to your unique pieces to properly showcase and enhance every aspect of your piece. We understand the importance and sentimental value that is placed on your family’s photographs. Once lost, these items can never be replaced. We strive to save as many photographs possible and use several techniques to mitigate further damage. Bartwood’s expert restoration technicians are skilled in digitally re-mastering photographs in an attempt to renew your memories. Bartwood offers a variety of artwork storage options including a climate-cooled warehouse and double-stacking storage vaults. So you can rest assured that your artwork pieces are safe and protected while in Bartwood’s hands. Whether the frame is 30 feet high or your artwork piece weighs as much as an elephant, Bartwood can safely deliver it to your home or commercial property. 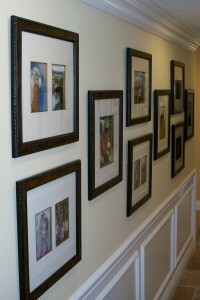 Our experienced professional installers will quickly and efficiently install your artwork exactly how you want it.